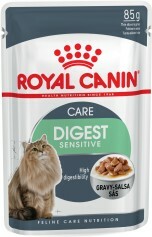 The Digestive Care formula contains highly digestible proteins (L.I.P.*). It is based on a blend of prebiotics (FOS: fructo-oligo-saccharides) and fibres (including psyllium) to help support a balance in the intestinal flora and regulate intestinal transit. 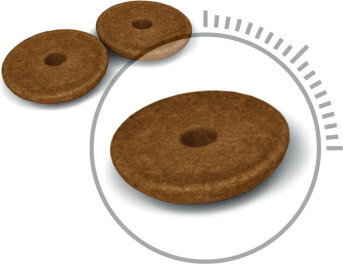 The Digestive Care ring-shaped kibble helps the cat eat more slowly and chew thoroughly for good digestion. L.I.P. : protein selected for its very high digestibility (more than 90%), for digestive health and stool quality. The exclusive use of Digestive Care is effective after 10 days: 49%* less stool production thanks to improved digestion and nutrient absorption. 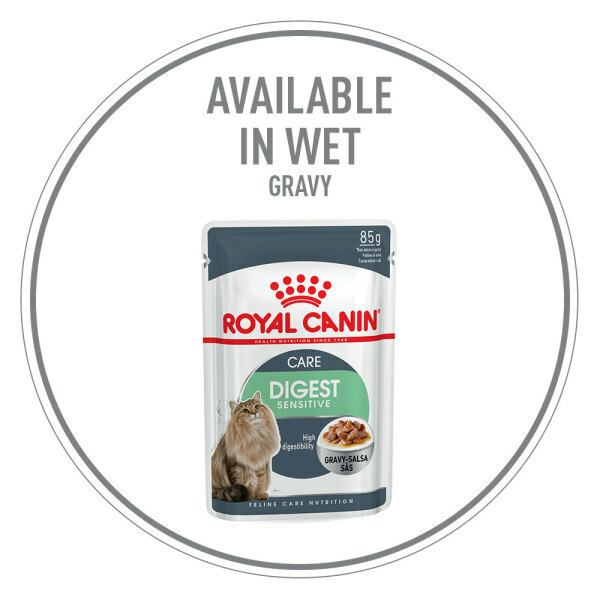 *Royal Canin internal study, 2014 - Compared to a maintenance feed for adult cats. Vegetable protein isolate*, wheat flour, dehydrated fish, rice, animal fats, dehydrated poultry protein, hydrolysed animal proteins, maize gluten, maize flour, vegetable fibres, chicory pulp, minerals, soya oil, fish oil, fructo-oligo-saccharides (0.3%), psyllium husks and seeds (0.2%). Crude ash: 7.8%. Crude fibre: 2.4%. Crude oil fats: 15%. Moisture: 0%. Protein: 33%. Vitamin A: 18000 IU, Vitamin D3: 900 IU, E1 (Iron): 42 mg, E2 (Iodine): 4.2 mg, E4 (Copper): 13 mg, E5 (Manganese): 54 mg, E6 (Zinc): 114 mg - Technological additives: Clinoptilolite of sedimentary origin: 10 g - Preservatives - Antioxidants.